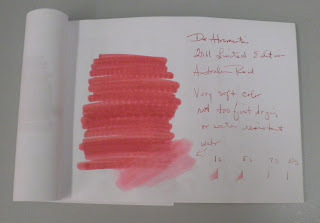 Another ink in the 2011 Limited Edition series is Australian Red, which has a softness to it that really appeals to me. The color seems to have a sandy quality to it that I think I would find in a desert area such as the Australian outback. 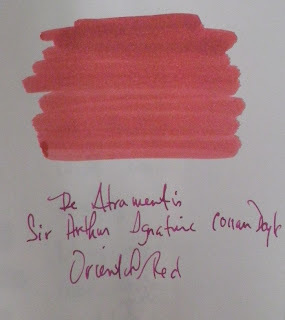 What really caught my eye was when I compared it to another great De Atramentis ink, one from the Historic Person line--Sir Arthur Ignatius Conan Doyle. 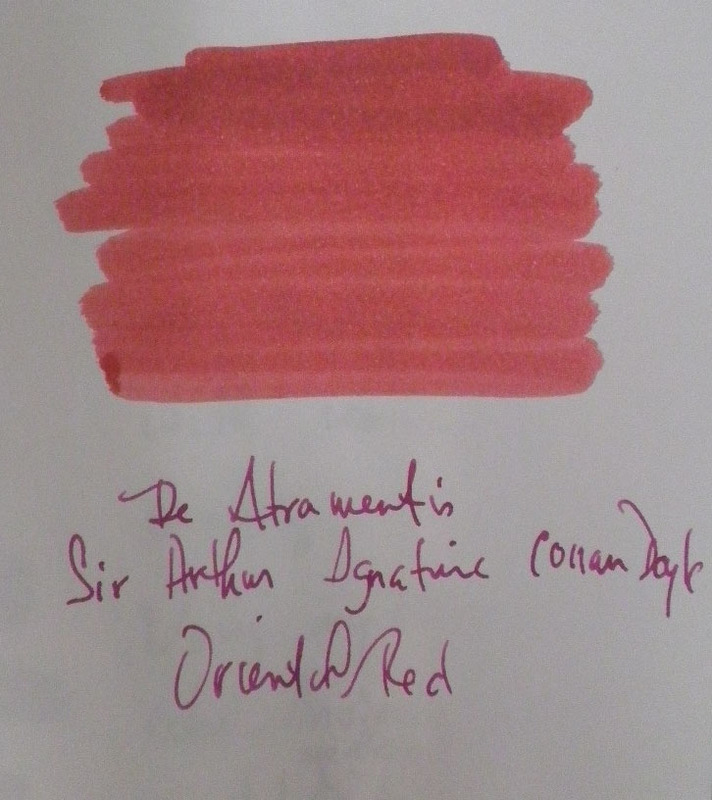 The colors are very similar, which is great as Australian Red is not a part of their permanent collection but the Conan Doyle--officially named Oriental Red--is always available. Not a fast drying ink, and not particularly water resistant. If you are interested in a great red, this would be your choice--but if you can't find it, try Conan Doyle for a very close replacement. Thanks to Julie (Okami) at Whatever for pointing this out, the March Carnival of Pen, Pencil and Paper is being hosted by European Paper Company. Do check this out, some great blog posts. Last night I was checking my emails and was somewhat dumbfounded when I saw about 30 that were for the December 2011 Carnival of Pen, Pencil and Paper that I hosted on December 6. Back at the time I was wondering why no one had submitted anything, but decided that with the Holidays at hand people were too busy. Then when the Carnival came out, several people emailed and asked if I could include posts they had already submitted but which hadn't gotten to me. Now I know why--and in addition to the original emails I also received duplicates, which explains why my inbox was so full. 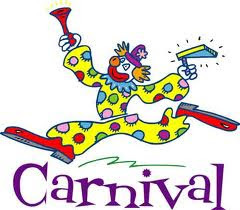 Here is the December 2011 Carnival part deux, with some great new posts. Keeping in mind that all giveaways have concluded, so entering, like resistance to the Borg, is futile. Millie presents the Clairefontaine roadbook. Check out Steven's custom-made desk organizer and his review of the TWSBI inkwells. Economy Pens has a holiday gift guide, a review of the Alvin Penstix, and a Zebra in Tul(le). TonyB reviews the Pilot Frixion Retractable. Clement Dionglay reviews the Quo Vadis Keith Haring Artist Series notebook. Sandra Strait, aka molossus, looks at two of my favorite notepads: the Rhodia dotPad No. 16 and the Rhodia "R" No. 16. EuroPaper has a post about Penmanship and Calligraphy. Tom Lynch reviews the Pilot Falcon, one of my favorite fountain pens. Dowdyism reviews the Stainless Steel Sharpie and the Marvy LePen in Oriental Blue. Julie (Okami) looks at the Franklin-Christoph Penvelope 6. Yosef has a post about Peanut & Chicken Penne inspired by Pad Thai. This month's Lost Crates Stationery choice is called Jetsetter, and focuses on travel-themed items. Albertine Press Jet Set Cards, a set of 8 note cards with complementary envelopes featuring collages of vintage stamps from around the world. Contexture Designs Map Notebook featuring a cover made from a map, and using a very nice cream/ivory blank paper that's about 80gsm and feels fountain pen friendly. A very cute handmade Cracked Designs card featuring a map of North America with a red string and two small fasteners so you can map your journey across the US, Canada or upper Mexico. Finally, a set of Forest Choice colored pencils manufactured from certified incense-cedar. 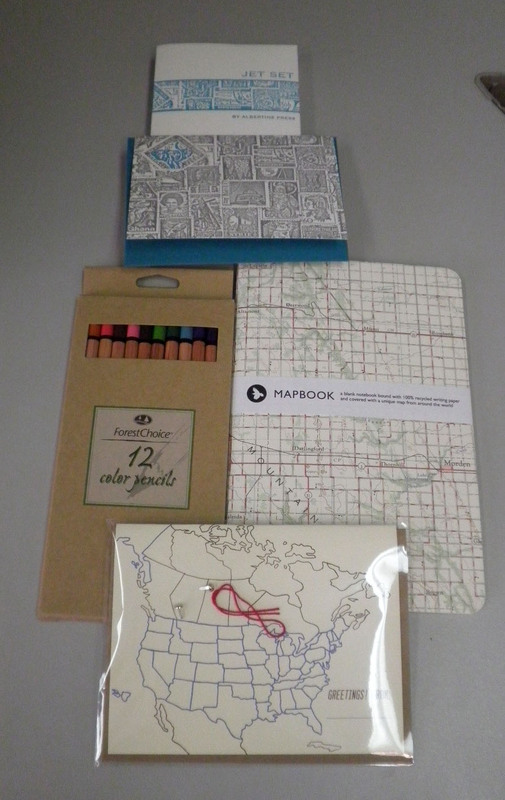 Excellent choices, and I especially like that Map Notebook. 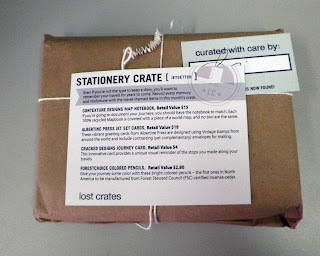 What was in your delivery this month? Work and knitting are keeping me busy, though I've got some new posts on the way, hope to have them up soon. The new Levenger catalog came, and I noticed their new Decathlon pens (ballpoint, rollerball, and fountain). The deep wine-colored resin coupled with the 10-faceted barrel reminds me of the Nakaya Decapod Aka-tamenuri series. This looks like a beautiful addition to Levenger's collection, and I am definitely marking this on my "would be nice" list. Thoughts? 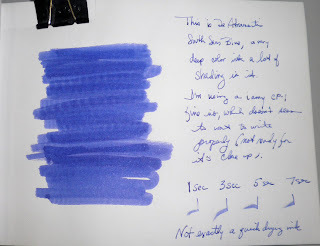 Just some quick thoughts on this De Atramentis 2011 limited edition South Sea Blue ink from Art Brown. It's a very deep blue color that does seem to have a touch of darkness to it, maybe a bit of purple or something. The shading is fantastic, I don't usually see a lot of that when I'm using a fine nib but it was very evident with my Lamy CP1. Definitely a bit on the wet side, drying time is about standard--not very fast, in other words. The ink isn't waterproof nor very resistant, so getting your writing wet is a problem. But if you are into bottle aesthetics, then this square, thick glass bottle is for you.